:In our Western, post-Christendom society, much of Christianity's cultural power, privilege, and influence has eroded. But all is not lost, says bestselling author Gerald Sittser. Although the church is concerned and sobered by this cultural shift, it is also curious and teachable. Sittser shows how the early church offers wisdom for responding creatively to the West's increasing secularization. The early Christian movement was surprisingly influential and successful in the Roman world, and so different from its two main rivals--traditional religion and Judaism--that Rome identified it as a "third way." Early Christians immersed themselves in the empire without significant accommodation to or isolation from the culture. They confessed Jesus as Lord and formed disciples accordingly, which helped the church grow in numbers and influence. Sittser explores how Christians today can learn from this third way and respond faithfully, creatively, and winsomely to a world that sees Christianity as largely obsolete. Each chapter introduces historical figures, ancient texts, practices, and institutions to explain and explore the third way of the Jesus movement, which, surprising everyone, changed the world. 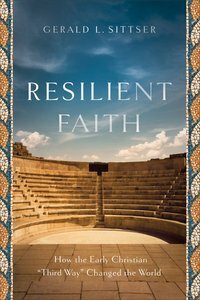 About "Resilient Faith: How the Early Christian "Third Way" Changed the World"
Gerald L. Sittser (Ph.D., University of Chicago) is professor of theology at Whitworth University in Spokane, Washington. He is the author of The Adventure, A Cautious Patriotism, A Grace Disguised, The Will of God as a Way of Life and When God Doesn't Answer Your Prayer. Sittser has won numerous awards and honors including a Gold Medallion Award from the Evangelical Christian Publishers Association for his book When God Doesn't Answer Your Prayer. His two most recent books Water from a Deep Well which surveys the Spirituality from the early martyrs to modern missionaries, and Love One Another which examines and applies the 'one another' exhortations of the New Testament to believers so we will aspire to Becoming the Church Jesus Longs For.